People call it Bike Camping, Bike Touring, Bike Packing, Bikepacking and a few other names. The bottom line, it is loading up your bicycle with all the equipment you will need and no more than you need, and riding out to stay out on the trail overnight, or over the Summer. There are so many different ideas about how it should be done, but the truth is, each person has to find the way that works best for them. When you are well prepared and have at least an idea of what your are doing, or if, for your first time you go Bicycle Camping or Touring with experienced people, you will have one of the most memorable times of your life! Plan well, weight your items, pack the right items and foods, and you will have one of the most fun times of your life! Set your bicycle up with a Front and Back Light. You never know when an emergency might happen. If you HAD to ride at night, or got caught on the trail at night, you will/might need good lights on your bicycle. If you go out without the equipment you need, if you don't know what you are doing, if you do not have camping plans ahead of time (and get chased off from where you stopped and set your tent up), if you are not prepared for emergencies (human or bicycle), your trip could be a disaster. First and foremost. Before you plan a Bike Camping Trip or Bike Touring Trip, make sure the bicycle you own will hold the weight you are about to put on it. If you do not know what weight limit your bicycle is rated for, if you do not have or it does not say in your Bicycle Manual, look on line. Don't forget to add your own weight into the mix...and don't guess, weigh your items and yourself on a scale. If you are buying a new bicycle for Camping and or Touring be sure to tell the Salesperson what you plan for the Bike. They will be happy to help you find the right and most comfortable, well fitting bike (for your body type) with you. Most are not being pushy, they are being helpful. 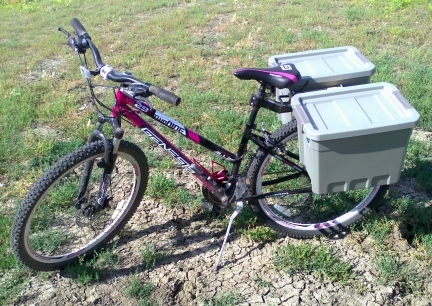 We have made our own Hard Sided Panniers, Fabric Saddle Bags as well as Customized an old worn out formed plastic child's Bicycle Trailer into a Camping Trailer. I have the information with photos of ideas you could use to make your own too on other pages at this site, see the Navigation Box at the right. When you start talking about the Best Bicycle Camping/Touring bags/panniers/totes, or any Bags for a Bicycle in general, there are a LOT of opinions. The most important thing your will need to know is that....Not all bags or panniers, saddle bags work for every bicycle. Fit of the bag on the bike you are riding matters too. The difference between Bicycle Panniers and a Bicycle Saddle Bag is very simple. Panniers are singular and a Saddle Bag is/are two panniers made into one piece. 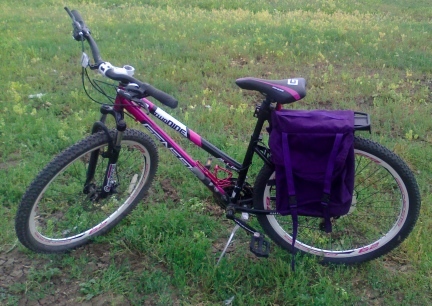 A Saddle Bag has a yoke that rides over the Rear Rack of your bicycle and ties on there and on the frame of a bicycle. Panniers are Large Bags that each hook into the top of the Rear or Front Rack on your bicycle and also the frame around the wheels. Is one better than the other? It depends on your riding situation and opinion. I prefer a Saddle Bag. The ones I make for our bikes have a handle in the middle of the yoke. This handle can be used for extra area to tie sleeping bags unto as well as the way to pick up and carry BOTH panniers easily. We bring all of our bags into the tent with us at night. Before you buy your bags for your bike, SHOP AROUND! There are many types and sizes and colors. There are bags that fit the handle bars, rear and front rack, under the seat, behind the seat, and about every bar the bike has to offer. Ride fully loaded a time or two on non overnight trips carrying your load for overnighting. Make sure all your bags and gear fit on your bike, all the bags are riding with no troubles, like your heels hitting your Panniers as you pedal, and that the bags are riding/staying secure as you hit bumps and bridges riding. If you feel a bit of wobble, make sure your bicycle is packed evenly, weight wise, on each side. Make sure all your bags are secure and tight on your bicycle too. Many people carry a Backpack, usually smaller than one for actual Backpacking, with gear in it, as they ride their bikes for Camping and or Touring. Not everyone is comfortable doing this and between the bag on your back and pedaling, you might run out of "steam" faster. The key to "The Right Bags for Bicycle Camping", are the right bags for YOU! 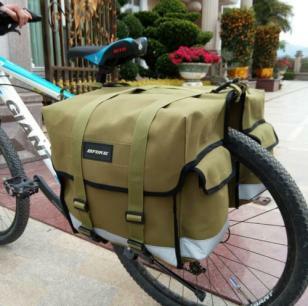 Not everyone likes to use Panniers, and they sure do not have to. There are all kinds of bags one can use on bicycles. Something for everyone. 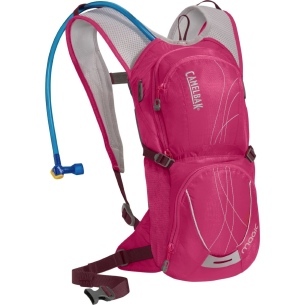 Also, the type of bags will also depend on how much equipment you will want to take with you. What type of bicycle you should use is up to you. You would not, of course, want to take your thin tired Road Bike on a back country trails. And riding a Mountain Bike on a complete Road Touring trip might not be the best idea. But. That does not necessarily mean you need a new bike. To start with, why don't you take the type of Camping Trip that your bike will travel. Make sure that the bicycle you are planning to ride, fits your body style. You will be riding a lot of miles, make sure you are comfortable and your body is not cramped up while riding. For some people they must have the most expensive bicycle money can buy. Others have to have a certain Brand Name tattooed on the bars. Some people ride a bicycle they bought from a discount store and have many, many, miles on them. Some folks ride bikes that were given to them by someone getting ride of it for one reason or another. My point? Ride the bicycle you like. If you are buying a new bike, buy the best you can afford. BICYCLE FIT, is a real thing. Deron and I have very expensive bicycles we had ridden for many, 1000's of miles, however, those bicycles are still in WI in a Storage Shed from when we moved here. 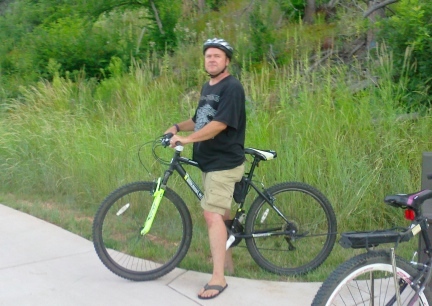 We had not ridden for the years we have been here in NW SD, so when we wanted to start riding again, another 10 years older, and me, fatter, we bought Walmart Bicycles to make sure we would even actually get out and ride them. We do. Deron and I are long legged. When I saw the 29" Men's Mt. Bike and rode it around the store, it fit me and the handle bars were such that they did not bother my wrists or shoulders. We love our Genesis 29" Wheel Mountain Bikes. As I write this (2014-09-11) we already have a couple hundred miles on them (started riding late May of 2014). It helps to, with any bikes really, that Deron is able to make adjustments out on the trail. 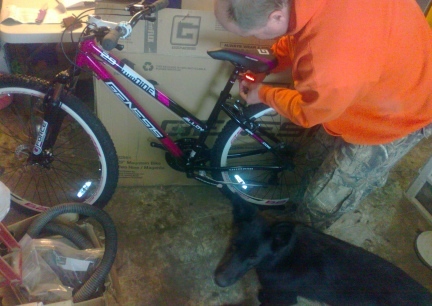 He built mine after ordering it on line and does our Maintenance Work on our bicycles. Bicycle Fit, that is, a Bicycle Fitting your body style and size, is a real thing. If you are riding an ill fitting bicycle, it will be like a Hiker wearing ill fitting boots. If you do not know about Bicycle Fit, visit a Bicycle Shop and ask a Sales Person to show you. Don't worry. You do not have to buy a bicycle just because you are learning about Bicycle fit, but it is nice to remember THAT shop and do your business there later. If you will be riding a bike that has not had a tune up in a while, you will want to take the time to do that yourself or take it into the shop before your trip. If your tire tread on your bike's tires are almost bare, buy new tires and instal them before the camping trip. You do not want to load up your bicycle on bald tires and take off down the road without tools, make sure you load them too. Many people prefer a Bike Trailer to pull their camping gear behind them as they ride their bikes. There are now several types of Bicycle Trailers available on the Market today. Some are made for camping or other gear, some for kid's to ride in, some are set up for pets to ride in and then there are the Custom Trailers. And hopefully no one reading this page will have to be told, MAKE SURE THE TRAILER IS IN GOOD REPAIR AND THAT IT WORKS/FITS THE BICYCLE YOU WILL BE HOOKING IT TOO. Manufactures have caught up to how people are now using their Bicycle Trailers. One can find manufactured Children's Trailers, Pet Trailers, Cargo Trailers and I am sure there are others. Even Walmart now sells a Cargo Trailer for Bicycles. 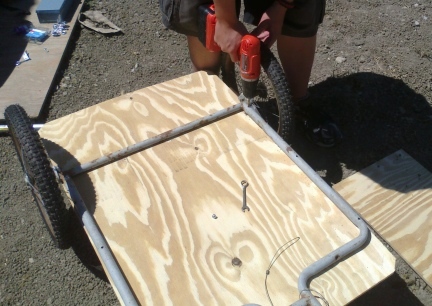 You can also Custom Make your own Bicycle Trailer, just make sure that you have test rides, several, before loading it up for a long trip. Make sure also that your trailer can handle all the weight you will be putting inside of it for travel. And. Remember. People have been using the manufactured Child's Trailers for pets and gear for many years. You might find one for sale at a Garage Sale, Thrift Store, in the local News Paper or on line. You might even find one in your own Garage or the Garage, being stored after years of no use. Clean it up, lube it up and take it for test runs. It will work just fine if loaded correctly. Do NOT add a lot of camping gear, preferably none, beside a child in a trailer as you travel. No one wants to be crowed for miles and miles on a trail to camp. Some ways of packing a Bicycle Trail with camping gear and children can be down right dangerous too. However, on a cold day, or chilly morning, your child or children might just love to be wrapped in a cozy opened up sleeping bag. If your pet is riding in a Bicycle Trailer, do NOT pack your food in the same area. Common sense will tell most people that pets and food, sitting side by side, is not a good thing. Your pet will be bored riding for hours in that trailer. It will get nosy. It might be hungry. It might just like to eat all the time. If you pack your food and your pet into the same Trailer and head down the trail to camp, YOU might be the hungry one for the trip. You might want to go camping from your vehicle before deciding to ride off on your bicycle with a tent and sleeping bag. Learn a little about camping. Some people do not like to camp and do not know it yet. Others love to camp and just have not found that out yet. Find out which person you are before you go off on a bicycle with really no safe way to load up in the middle of the night and go home. Lots of things go bump in the night. Bugs can be terrible. Storms happen even when weathermen have not told us they were coming. It can be very hot or very cold at night in a tent. WHAT TYPE OF GEAR SHOULD YOU TAKE WITH YOU? If you are planning on a Camping Trip, or Camping while out on the Trail, take camping gear. But here is the thing. Each person, for the most part, has a different idea of what Camping Gear is. For some a Blanket and Tarp will be fine for them for a week or more. For others (I am one) nothing less than a Tent and Sleeping Pad and Sleeping Bag and my blow up Pillow will do. I have to admit, I probably carry more items than I need. I am of the "better safe than sorry" group. By all means. Try. Really Try. To not take any more with you than you really need and will use on the trip. Keep in mind, you will be carrying each item, and the weight adds up, on the trail, uphill and downhill. There are items that should not be left behind. A First Aid Kit is one. It also matters if you will be cooking on the trail or eating out. If you will be able to buy groceries per day or will be far away from civilization. What is the water like where you are going? Do you need to carry a Water Filter of some sort? If you will be cooking, what type of small stove and fuel will you be using? How much, how many days worth of fuel, will you be using? Don't forget your toiletries and extra wet wipes. Wet Wipes can be used to wipe with, but also to wash with, to clean your dishes with, to clean up your bicycle of oil or mud in your wheels or break area, and so much more. How much Cash should you take will depend on where you are going and how much you intend to buy there. If you carry groceries with you, you will not need as much cash. If you are planning to eat each meal out in a Restaurant, you will need a Credit Card or a Lot of Cash. What if bad weather hits? Will you then stay in a Hotel? Don't forget that Emergency Money. Bikes break and are stolen on these trips. Stolen Bikes, some even in the wilderness brings me to, bike locks and weapons. Will you plan to take either? How much Ammo will you carry with you? Take at least a small notebook or a book you do not mind writing notes inside of. Take a pen with you, one that writes in the Winter, if Winter Camping, and those new items that write in the rain are not a bad idea. Even if you think you will not be writing anything, take it. You never know, you might run into a person out there you would like to keep in touch with or God Forbid, need to write down a License Plate on a vehicle or description of someone or a note to family if the worse happens. Usually what people write are random thoughts or notes on their trip. If you are a Backpacker you will know just what to pack. If you are a Vehicle Camper think about the items you do not need and leave those at home. If you still would like to have a check list, see below. Where do you want to go? My first suggestion is to buy a book on the trails and areas other people ride and bike camp on in the State or Country you live in. Start local, or at least closer to home than that big dream trip you want to take. Rails to Trails Trails are wonderful for this sort of sport. You can find information on line, at the local trail heads (usually maps), or many people write information books about the Trails with Camping and Hotels as well as Restaurants offered in each town....call ahead to make sure the Businesses are still offering the services the book says that they do before counting on them for your food and sleeping facilities. You might want to take a one night overnight trip first. Maybe ride out and camp or go to a town that offers food, entertainment and camping or hotels. Ride back the next day and decide if this is something you enjoy doing. This is NOT a good idea for everyone. In fact there are just a few people that can actually ride off on a bicycle for days and nights on end. If you do not know if you are one of these folks.... First take a bike camping trip with friends and see how that goes. Then ride a lot of miles alone during the daylight hours and see how that goes for you. You still might not know if you are one of the people that can travel by bicycle alone, but it will give you a better idea. This can be a LOT of fun. But with most people, you need to plan before you go, make sure everyone agrees with the mileage per day, the destination, how you will cook, or eat or sleep. Make sure the plans are full and that you all stick to the plans or agree, that is everyone, to deviate from the original plans. Talk about the trips details with friends. Make sure you understand who is in charge of what. Many times different folks understand or just think differently than others. This can be a problem. If you think that you will be riding 10 miles per day, but your friends thought you knew, without mentioning it, that they travel 40 miles per day, this will cause friction. If you think your friends are bringing the stoves for cooking and they thought you were, because you did not talk about it, this can cause friction. If you thought you were sharing a tent with friends, but your friends are sleeping in their tents alone or with one another or with their gear and bike, this can cause friction. TALK ABOUT THINGS YOU DO NOT EVEN THINK ARE AN ISSUE SO THAT THEY DO NOT BECOME AN ISSUE AND RUIN A GOOD TRIP AND A GREAT FRIENDSHIP. Be kind even when you are tired. Be a hero, carry a candy bar for everyone in the group as a late night surprise in camp. Try to be flexible and remember, this is NOT just your trip, it is everyone's trip. Take maps, have ideas for fun on the trail or ideas of areas to visit. I highly recommend that if you have not been out camping or have not yet Bicycle Camped or Toured, sign up for one of these events. Not only are they fun, but you will learn a lot about Bike Camping with the support of others near by. Some of these rides have SAG Wagons that follow along, to carry your gear, feed you lunch and snacks, carry you and your bike if you or your bicycle get broken, and offer the knowledge of the area you are riding in. Priceless. These events have already organized everything from miles per day, where to camp or sleep, food, tools for those that forgot, they have organized it all. At first the price of such a trip might seem high. But when you add up all the food and or sleeping as well as travel arrangements as well as the support on the trail you will be receiving, most are quite worth the money. Before you load up your bikes, grab the kids and head out for this "fun" experience, I beg you to take your kids on a camping trip where you drive up to a site, throw a tent, have a ring for a fire and see how it goes. You sure do not want to be exhausted from cycling all day and deal with kids in a camp site you will have to reload a bicycle and load them back up from to go home in the middle of the night because you just can not take any more! Further, you will need a good meal and sleep, because the morning after, you will be loading up and pedaling away again. Think this out before trying, and like I said, take the family camping by vehicle first. Is your child well behaved? 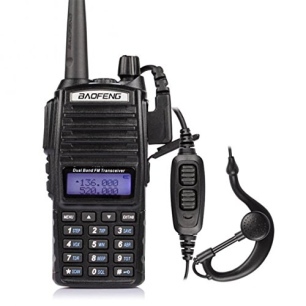 If your child is loud and out of hand, this trip will not be fun not only for your, but everyone else in the campground or with you on the trip. This IS a fun event though. One to work up to. One to ready your child for. One to work up your miles hauling the weight in the trailer for. But probably not a trip you just think of and go. SHOULD YOU TAKE YOUR PET(S) WITH YOU ON THE TRIP? If you have a well behaved pet, that can ride somewhere within all you need to carry out on the trail, or one that loves to run with you as you ride your bike, you might take your pet with you. Be sure though, that if your pet runs beside you as you ride that the pet is ready for all the miles you will be going. Also remember, a dog that normally runs on dirt is going to take punishment running on pavement or stones for many miles. You will need to keep your miles down to the dog's ability and not beyond the dog's ability for each day. Also, you sure would not want to take a pet, especially on that would run beside you, in hot weather. Make sure that your dog is allowed in the areas you are going. Many Camp Grounds do NOT allow pets, the same is true for Hotels and Motels. Where will your pet wait for you if you go into a Restaurant or Bar? Also. If your dog is a "barker", leave it at home. It will not be fun for you or the others there where you are headed to have your animal ruining the trip for everyone. Small pets can ride in a Basket or in a Trailer, but make sure the animal is secure and safe and used to riding there. You might not find a Veterinarian out where you are going, or fast enough when riding a bicycle. If it is not going to be fun for the animal....leave it at home or with a friend while you are gone. If you do take your pet be sure to take the items you will need for them. Dishes, extra water, food, toys. You will need to carry a LOT of extra water if your dog is going to run the trip with you. Remember that your pet, sitting in a Bicycle Trailer, may be in the sun all day. Your animals count on you for their well being. Don't let them down. Don't overrun a dog or keep a small pet in a HOT Trailer to overheat. Make sure they are welcome where you are going and include them in your activities. I am so saddened that I lost all of my photos and the Newsletter Article I wrote about some of the Bike Touring I did in the 1990's. I lost them to Black Mold in our home in N WI. Gone for ever. Take a lot of photos of your trip. Store the photos in more that one place. Write a Journal, or make a Scrapbook of your Bicycle Camping. In years to come, you will want to see those again! If you were given or had maps or brochures from your Touring, keep them tucked into your Journal. Your friends and family will want to see where you have gone and what you did there and hear about your trip. Next week or next year or in years to come YOU will want to once again live that trip (those trips) in your own mind. A Journal will also make your next trip better. You will remember to take items with you you might have forgotten on the trip before. Notes and Lists can be made and used for many years to come. Be sure to be honest with yourself and those you might be Bicycle Camping or Touring with about your own abilities. Make choices based on the safety of yourself and those you will be traveling with. We are not responsible for the trip you are setting up and how you chose to take it. We don't know you, have never talked to you, and are only giving ideas and information here on this page. PUT SAFETY ABOVE ALL. MAKE YOUR CHOICES WISELY. HAVE FUN. I hope a lot of the information above has helped you decide what you might want to take with you and what you might want to leave at home. This is a list of items I take with us on trips over two days and when we are cooking and camping on the trail. The contents of this page for Bicycle Camping & Touring is still under construction. Please check back later!